100% pure latex filling covered with a waterproof, non-slip top cover gives an unrivalled combination of cow comfort and durability. 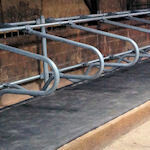 Fully fitted to the cubicle bed, front and back with strips and bolts. Unique woven texture top cover provides a secure, non-slip footing and a non-abrasive surface in contact with the cows' skin. Mattress can be power-hosed at turnout. Mattress materials have natural mould-inhibiting, anti-fungal and anti-bacterial properties. 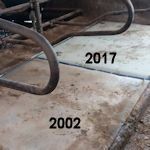 Our cow mattress comes with a 10 YEAR warranty. It retains elasticity throughout it's life, as the picture shows. Has been used in the UK since 2005 with no wear problems. Has been used in the UK since 2001 with no reported collapse or loss of elasticity. 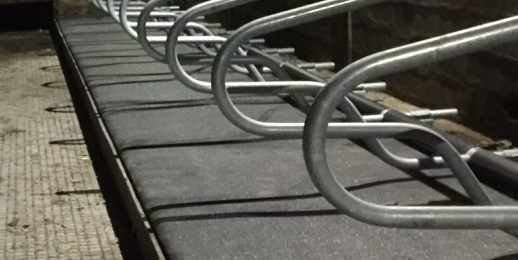 We have teams of fitters working across the UK who will fit the mattress for you, or we can deliver it direct to your farm for you to fit yourself. If you want to install yourself, we will supply all the fixtures and fittings necessary to securely attach all edges to a concrete base. 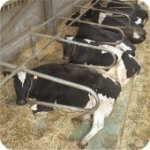 The cows are very comfortable and look very well and very happy. In spring they have the choice of lying inside or in the fields and some of them prefer the mattress. 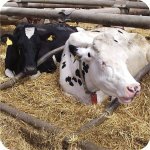 See pictures of our latex cow mattress installations on farms across the UK.